Adelfia (meaning 'brothers', in Greek; Barese: Adélfie) is a town and comune in the Metropolitan City of Bari, Apulia, southern Italy. 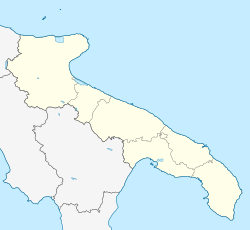 The town is a combination of two smaller towns, being Montrone and Canneto. The urban center is constituted by two former villages (Canneto and Montrone) that were separated for a long time. Canneto was founded by the Normans of Robert Guiscard between 1080 and 1090, on the place of an ancient center (probably to be identified with Celiae), documented from ceramics and more recent graves from the 4th century. Montrone was founded in 980 by Greek refugees. Both had been subdued to varied feudal lords until 1806, when feudalism was abolished in the Kingdom of Two Sicilies. The two centers were united in 1927 under the artificial name of Adelfia, from the Greek term adelphòs, meaning brotherhood. Between the 19th and the 20th century they suffered a considerable emigration towards the United States. The city life is today mainly connected to that of the nearby Bari. Although some findings attest to the presence of human settlements in Canneto and of a necropolis of nearby Celiae dating back to the Messapian age, for the official historiography Canneto was born in the second half of the 11th century. In 1926 the proposal for the merger of the two Municipalities was launched from Canneto, supported by the Colella brothers, who had achieved a solid position in the wine trade. When it came to giving the name to the new Municipality, Luigi Volpe suggested «Montelarino», an area that straddles the two Municipalities, perhaps the name of an ancient village, destroyed by time; the name "Adelfia" was preferred. After almost 100 years there is still a conflict between the two parts of the city. Some say the question of what city are you? there are people who respond from Canneto or from Montrone.